For other uses, see Bean bag (disambiguation). 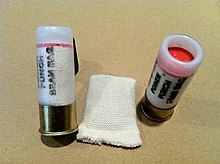 A bean bag round, also known by its trademarked name flexible baton round, is a baton round fired as a shotgun shell used for less lethal apprehension of suspects. The bean bag round consists of a small fabric "pillow" filled with #9 lead shot weighing about 40 grams (1.4 oz). It is fired from a normal 12-gauge shotgun. When fired, the bag is expelled at around 70 to 90 metres per second (230 to 300 ft/s); it spreads out in flight and distributes its impact over about 6 square centimetres (1 sq in) of the target. It is designed to deliver a blow that will cause minimum long-term trauma and no penetration but will result in a muscle spasm or other reaction to briefly render a violent suspect immobile. The shotgun round is inaccurate over about 6 metres (20 ft) and has a maximum range of around 20 metres (70 ft). Changes to the bean bag round since its inception in the early 1970s have included a velocity reduction from 120 to 90 meters per second (400 to 300 ft/s) as well as a shift from a square shape to a more rounded sock-shaped projectile. 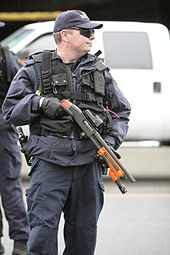 Shotguns dedicated to being used for bean bag rounds are often visibly modified with either yellow or green markings, or bright orange stocks and stops, to reduce the possibility that a user might inadvertently load lethal munitions into the weapon. Bean bag rounds are used when a person is a danger to themselves or others but is not a direct threat in such a manner that deadly force would be appropriate – typically a suicidal individual with a bladed weapon. The round is intended to disable the person without killing them. A bean bag round can severely injure or kill in a wide variety of ways. They have caused around one death a year since their introduction in the U.S. A round can hit the chest, break the ribs and send the broken ribs into the heart. A shot to the head can break the nose, crush the larynx or even break the neck or skull of the subject. This is why many officers are taught to aim for the extremities when using a bean bag round. A strike in the abdominal area can cause internal bleeding or strike the solar plexus which can disrupt breathing or heartbeat, but such a hit is generally safer than most other areas as well as presenting a larger target than an extremity. Fatalities are occasionally the result of "mistaking" other shotgun rounds for bean bags. In 2013, in Park Forest, Illinois, an autopsy showed that a 95-year-old man had died from hemoperitoneum as a result of being shot by police with a bean bag gun. ^ a b c Ijames, Steve (August 29, 2005). "In defense of the 12-gauge "bean bag" round". Policeone.com. Archived from the original on 5 September 2008. Retrieved 25 March 2011. ^ a b Hubbs, Ken; Klinger, David (October 2004). "Impact Munitions Use: Types, Targets, Effects" (PDF). National Institute of Justice, United States Department of Justice. Retrieved 25 March 2011. Rising, David (27 October 1998). "Dartmouth police try new tactic". The Standard-Times. New Bedford, Massachusetts. Tsai, Michelle (7 May 2007). "What's a Socklike Projectile?". Slate. This page was last edited on 2 February 2019, at 22:21 (UTC).